And yes, I did say "shared bathroom." The one big sacrifice we made when we bought this house (because it's such an old home) was a master bathroom. *gasp* And yes, like much of the population, we lived to tell the tale! In this HGTV-crazed world it's easy to forget we're not the only ones without *perfect* houses and that that's okay. We can still love where we're at, even if it's not perfectly instagram-able. 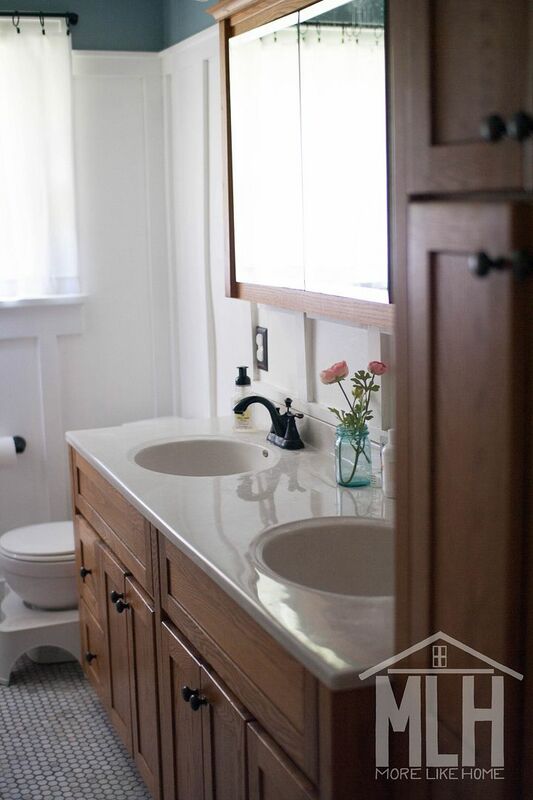 Stick to grown-up finishes for all the permanent features: beautiful wood vanity, clean white paneling, tile floors, satin black fixtures, etc. This means the bulk of the bathroom is still beautiful and timeless. I'll still love it when the kids are grown. There are no bright paint or crazy tile I'll want to rip out in a few years. Don't be afraid to add fun, kid-friendly flair but limit it to more temporary items. 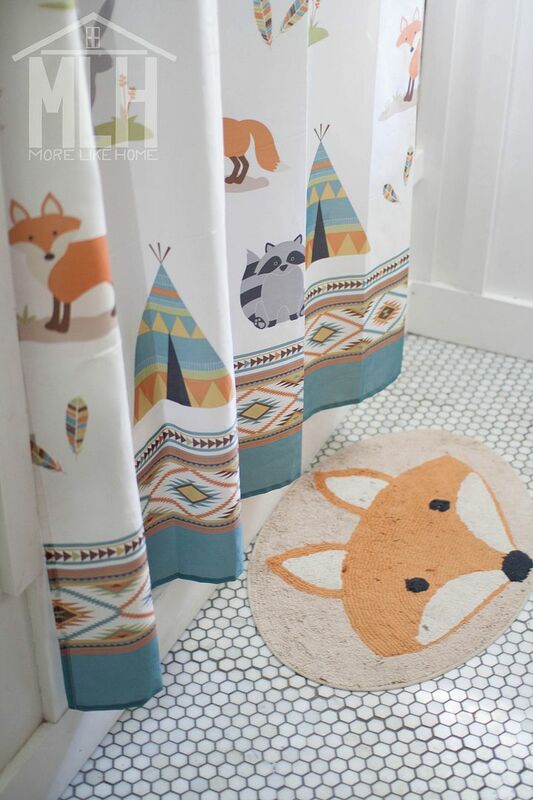 Like the shower curtain and rug. It's fun for the kids, but I can easily switch them out when the time comes. 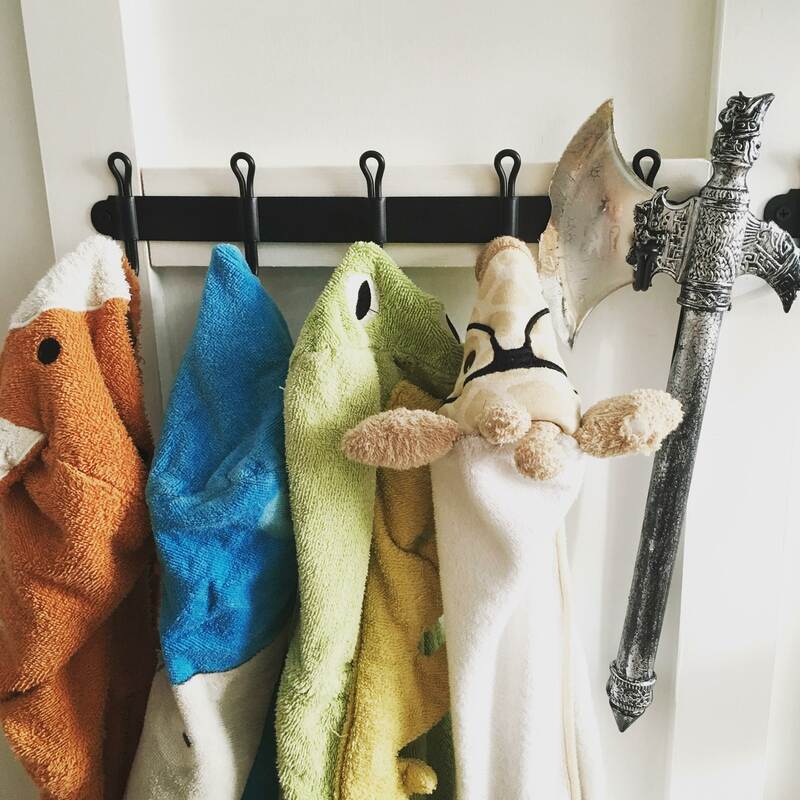 We also love having a cute hooded towel for each of our kids. They are cute hanging up, fun to use, and it's easy to know who left theirs on the floor. Pick kid-friendly items that you won't hate looking at for the next ten years. The shower curtains has cute critters, but it's still mostly white. The style is simple and the colors are muted. Even though it's a kid's set, it's still beautiful. Would my kids have loved a PJ Mask shower curtain? Yes. But I would have hated it. And the goal here is a bathroom for all of us. Think about who can reach things. This is a big part of how your bathroom functions, but also a chance to use beautiful things. A.K.A. things you don't hate. Kids' toothbrushes can be hidden in a low drawer or put in cute cup on the counter. 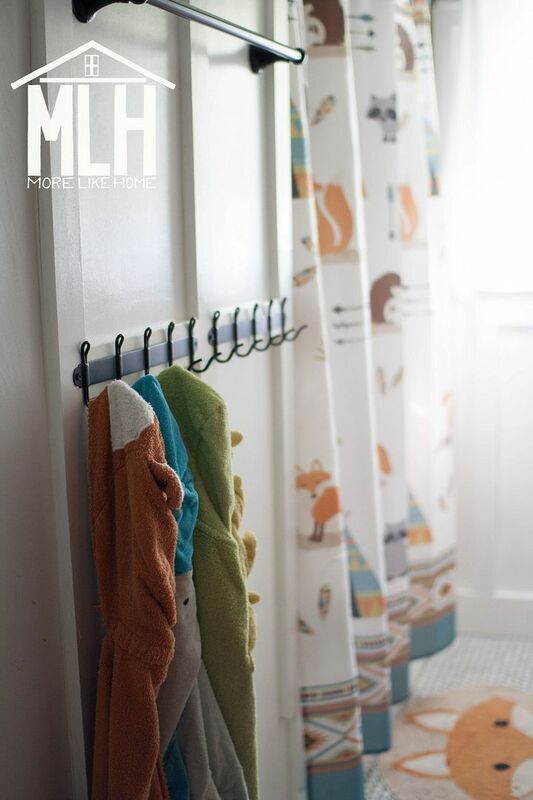 Install towels hooks low on the wall (more details on that in this post) and hang those cute towels. Need a step up to the sink? Pick a plain white one to fade into the background, or a beautiful wooden step to add warmth. Make conscience choices toward items that still look good while they serve you well! And on the flip side of "put kid things down low" - also put poisons up high (we keep things like toilet paper and bath toys under the sink, while all the cleaning supplies are at the top of our linen cabinet). That's all there is too it. Keep these tips in mind, make thoughtful decisions, and create a bathroom that works for your whole family. Now if you've made it this far and you're thinking "But I don't need kid decor at all. Kids will do just fine in a regular, grown-up-styled bathroom." You're totally right. You can make that work and it will be beautiful. In fact, I myself was firmly planted in that camp for years. Before we had kids, I swore I would never have themed bathroom. 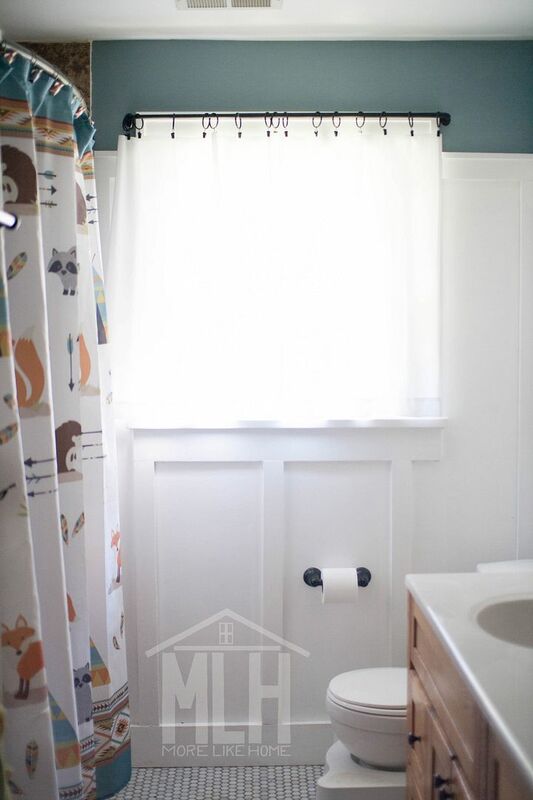 When we bought our first home (I was pregnant with M1) I decorated our tiny bathroom simply - beautiful shower curtain, paint, done. And it was great! I had no regrets and even when we started adding kids I never looked for anything different. Then, a couple years ago, we moved to house with two bathrooms. My beloved shower curtain was perfect for our main-floor bathroom, but that left the upstairs bathroom totally naked. Guys, I went to three stores looking for a shower curtain but apparently my hopes were too high and I hadn't found a single curtain I loved. As I walked through my last stop (Wal-Mart)... I saw it. There was the curtain that felt like it was made for us. And it was kid-themed. But wait - I don't want a themed bathroom! My gut was all "The boys will love this." Any my heart was all "You're right we should totally get it." And my brain was like "Fine put it in the cart." So I did. And the matching fox rug. And the shower curtain hooks. And the garbage can. And the foxy hand towels. And just like that I had a matchy themed bathroom for the kids. And they totally love it. And it turns out I love it too because, even though it's a kids bathroom, it's not totally a kids bathroom. The white space, the calm colors, and the grown-up touches have really made it work for all of us. Anyway, there will be plenty of time for fancy grown-up decorating later. They'll grow up before I know it. Have a great tip for designing spaces that work for your whole family! Leave it in the comments!